MT SINAI/HOREB – IN ARABIAIn 1978, when Ron found the chariot parts in the Gulf of Aqaba just off the Egyptian shore, he knew that Mt. Sinai had to be on the opposite shore. Since the Biblical account tells how the people arrived at Mt. Sinai after they crossed the Red Sea, and since the Gulf of Aqaba separates the Sinai Peninsula (Egypt) and Saudi Arabia, there was no doubt as to the location of Mt. Sinai being in Arabia. But where in Arabia? This description indicated to Ron that the people were “in” a mountain range – protected within its borders. And for that reason, Jebel el Lawz was the perfect candidate. On the map, Jebel el Lawz was the highest peak in the entire NW Saudi Arabian region; and it was in a mountain range with numerous wide wadis, or canyons, within it which would have provided enough acreage for a tremendous number of people, along with their flocks and herds, to camp “within” the area and have the protection of the mountains all around them. It was also separated from the mountainous region which paralleled the Red Sea, by a desert, or plain area – which could be the desert of Sin(ai). If this mountain was indeed the true Mt. Sinai, Ron felt there had to be archaeological evidences which would prove it beyond a reasonable doubt. So he applied to the Saudi embassy for a visa to visit the area but never even received an answer from them. After 4 1/2 years of doing so, he decided it was going to be necessary to attempt to enter the country without a visa. He made inquiries and was told that if anyone was found in Saudi without a visa, they were simply escorted to the border and “kicked out”- if “worse came to worse”, they would be held for no more than 21 days. He weighed this information and decided it was certainly worth the risk. Little did he know what lay ahead for him and his sons, Danny and Ronny. Ron, Danny and Ronny Enter Saudi IllegallyOn Jan. 24, 1984, Ron and his sons arrived in Jordan- they had applied and received a Jordanian visa prior to leaving the U.S. They toured Jordan a bit and then parked their rental car near the border and walked into Saudi undetected. Hitchhiking and hiring taxis, they arrived near Jebel el Lawz, where Ron saw white pillars lying on the ground, the sun reflecting off the white stone. He believed this had to be the site of Mt. Sinai and he saw the entire top of the mountain to be blackened as if charred. He noted several features of the site which identified the area – there was a lone tree atop one peak with a cave just below it. As Ron surveyed the region around the mountain, he saw that here was an area that perfectly fit the description of Mt. Sinai (Horeb) – there were thousands of acres of land surrounded by a mountain range which enclosed the area. He was convinced that this was it! But as they got nearer the base of the mountain, a small Datsun truck pulled up and the man inside brusquely told Ron and the boys’ driver to take them back to where their taxi was waiting for them, which he did. Then, they got back into this taxi and headed to the Jordanian border. “The Wyatts are Israeli Spies”However, when they arrived at the border, things didn’t go so well. As they attempted to exit the country, they were abruptly arrested and taken to a jail in Hagl, near the border. They were being charged with espionage. Only upon their release did they learn that a man whom Ron had told of his plans to enter Saudi illegally, had called the Saudi embassy and told them that the Wyatts were actually Israeli spies. The Saudis told Ron this man’s name when they were released. Knowing that their plan to enter Saudi was not without some danger, Ron had told two trusted friends what he was going to do- he simply told his family that he and the boys were going to Jordan. One of those Ron confided in was Col. Jim Irwin, and the other was the man who called the Saudi Embassy with the tale that got them arrested. Once the Saudis discovered that Ron and the boys were not spies, they were very angry at the false accusation, realizing that this could have led to serious political consequences had they executed Ron and the boys. They wanted to help Ron prosecute this man, but Ron declined their offer, content to simply go back home. When Ron and the boys first arrived in Hagl, the Saudis were experiencing a terrible plague throughout the compound in which they were held, and numerous men had died. It was easy for Ron to see what he felt had to be the problem- the area was infested with mosquitos. Ron had explained to his captors that he was an anesthetist, which they could only understand when he termed it “sleep doctor”. He told them he could help them if they would listen, and with men dying, they did. Ron first wrote prescriptions for antibiotics for all of those sick, which the pharmacy in Hagl honored and filled. Then, he gave them aspirin for their discomfort and to keep their temperatures (fever) below deadly levels. Finally, he asked for massive amounts of olive oil, which he poured into their toilets- the mosquitos were thriving in their archaic plumbing system. They also poured the oil in all standing water in the area, and immediately the plague was arrested. The oil on the surface of the water smothered and killed all the mosquito larvae. No new cases arose and those who were sick when he arrived recovered. Needless to say, this had to have given him and the boys at least a little favor with the local authorities. Ron and the boys were separately questioned day after day by a group called the Interrogation Team. They each told their story- of their belief and reasons for that belief, that Mt. Sinai was Jebel el Lawz. One Saudi official, Abu Collet, sent men out to the mountain to determine if any evidence was actually there, but the men came back with a negative report, which was sent to the King. But there were some among the interrogators who believed Ron. One day three Saudis took Ron on a trip in a helicopter to the shore of the Gulf of Aqaba where Ron claimed the great multitude had crossed the sea – Ron’s story was being checked out thoroughly because the charge of espionage is a “deadly” serious charge. The helicopter landed on the beach directly opposite Nuweiba, Egypt. It wasn’t too difficult to find the right area because Nuweiba is easily seen across the 8 mile gulf. Landing there, on the beach they found a Phoenician-style, granite column erected on the shore, with inscriptions in archaic Hebrew. The Saudis took numerous photographs of this column, and Ron suddenly had a little more credibility with his jailers. Archaic Hebrew simply isn’t found in Saudi Arabia and here was some very concrete evidence. In fact, it is possible that this column literally saved Ron and the boys’ lives. 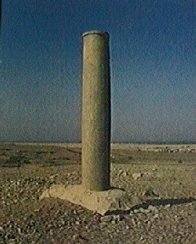 No one in Saudi had known about the column as it was in an extremely remote, uninhabited area. But even this column didn’t insure their release. However, it did match the column Ron had found in 1978 on the opposite shore in Egypt – only this one had the inscriptions on it! While Ron’s helping stop the plague, and this discovery of the column on the beach may have resulted in their receiving relatively good treatment, their release didn’t look too promising to Ron or the boys – due to the nature of the crime they were accused of, they weren’t allowed the customary call to their embassy. Ronny, his youngest son, eventually began to “crack” under the isolation. He told Ron and Danny that he was going to make a run for it – he just couldn’t stand it any longer. Ron knew Ronny and knew he meant it. They all knew if he was caught, he would be shot on sight. So Ron told him “ok”, but they needed to all go together – and they needed to do it when the Moslem holy day began on Thursday night. Ron knew that security would be the loosest at that time. And they formulated their plan. When Thursday came, there arose a problem – Ali, a guard whom they had become quite fond of, was on duty. He had shown them extreme kindness throughout their ordeal, and Ron explained to Ronny that if they escaped while Ali was on duty, he would be shot. Ronny knew this was true and agreed to wait until the next Thursday. Depressed at the thought of waiting another week, they went to sleep. The next Wednesday morning (the day before they had agreed to attempt their escape again), the man in charge came to them: “Halas”, he said, which meant “Finished”. It was over – they had been cleared and were to be turned over to the Jordanian government. But none of their confiscated film would be returned to them- for all their troubles, they would have no evidence; no pictures of Mt. Sinai. Had Ron been wrong in crossing into Saudi without a visa? Had he been too impatient? BILL KURTIS: “Three weary Americans came home Monday night; Ronald Wyatt and his sons, Daniel and Ronald, Jr., at the end of an amateur archaeology expedition that landed them in a Saudi Arabian jail. They entered Saudi Arabia illegally, searching for the site of the Biblical Mt. Sinai. Repeated requests for a legal visa were turned down, so the Wyatts slipped across the Jordanian border, only to be arrested by Saudi police as they were heading back. Now what followed was a hair-raising 75 days in custody. Ronald Wyatt and his sons are with us in the studios of our Nashville affiliate, WTVF, to tell you all about it. Gentlemen, good morning! BILL KURTIS:Uh, Mr. Wyatt, you there in the middle, your sons on either side, why did you,…uh, I didn’t know that Mt. Sinai was in Saudi Arabian territory! Why did you think it was? RONALD WYATT: We found some chariot parts that looked like the chariots found in King Tut’s tomb in the Gulf of Aqaba, west of this Jebel El Lawz. Now, we found these at depths from 60 feet out to 200 feet and over a stretch of about a mile and a half. And we believe that was the crossing site, so in the Biblical narrative, they arrived at Mt. Sinai after crossing the Red Sea. The language in the Bible indicated that they stayed `in’ a mountain; enclosed in a mountain. So, an aerial map showed that this Jebel El Lawz had a large valley enclosed in the rim of an ancient volcano. There’s about 5,000 acres in there. We felt this was the place. And, in Exodus 24:4 and Leviticus 6:28, 11:33 and 15:12 it tells of some artifacts that were to be found. There would be twelve pillars of stone and an altar and some pottery, and so this is why we looked at that particular mountain. The frustration Ron suffered at getting so close, yet coming away with no evidence, was intense. It seemed impossible that he would ever be able to return to the site again. After all, he was now quite well known in the area as an accused spy. Ron hadn’t been home too long when he received a phone call from a man who said he was a friend of some of Ron’s captors. Samran Al-Motairy was a close relation of the king – he was considered “royalty”, and he had heard of Ron’s claim that Mt. Sinai was in his region. There had been several of Ron’s captors who had believed Ron’s claim, and they had convinced Samran, who lived in Tabuk, just a couple of hours from the mountain. Samran told Ron over the phone that ever since he had heard about this mountain, he couldn’t eat, sleep or concentrate on anything- he had to see it for himself. Samran even came to Nashville and spent several days with Ron to discuss the matter and convince Ron to return to Saudi. Now, Samran is a wealthy man with numerous wives, a fleet of automobiles which include a Rolls Royce, limousines and Mercedes, and a home which is more aptly described as a “compound”. He didn’t need more money, but human nature being as it is, perhaps he saw in Ron’s discovery the possibility for his chance at fame and even more fortune. But, most importantly, Samran said he “wanted to do something for his God.” After all, Mt. Sinai is a very important holy site for the Moslems as well as the Christians and Jews. Samran had the connections – Ron had the knowledge of this most holy site. Together, they could “discover” this site, maybe even make a movie and be famous. These were Samran’s desires. Ron’s desire was to document the evidence. And Samran’s proposal seemed the ideal way to get the evidence. The hard part would be to get Ron back into the country, but Samran said he could do it. And it was just eleven months after his and the boys’ release from prison in Saudi that he would return to Jebel el Lawz – legally. But other things were keeping Ron busy. Four months after he was released, in August of 1984, Ron was back at Noah’s Ark – interest the “boat-shaped object” increased when Ron took an interested party to the site. After seeing the evidence, Marv Steffins called a press conference in Ankara and announced the “discovery of Noah’s Ark”. While this seemed like a bad move for the project at the time, it caused the Turks to take special interest in the site. Ron returned to Turkey on October 26, 1984 and finally, things seemed to be moving on that project. Col.Jim Irwin had also gone to the “boat-shaped object” with Ron in August of 1984 and knew there was something there which needed scientific exploration. At that time, Ron and Jim had agreed to continue their individual explorations- Jim’s on Mt. Ararat and Ron’s at the “boat-shaped object”. Their reasoning was that they both had the same goal – to find the real Ark. Jim Irwin, though not convinced that the “boat-shaped object” was the Ark, felt that it needed thorough scientific study before any conclusions were drawn, and that Mt. Ararat also needed to be thoroughly explored. After all, traditional thought was that the Ark had to be on Mt. Ararat. If no ship was found on the mountain, maybe this was the Ark. Their conclusion was that the true answer to the fate of the ship depended on both efforts. Then, early in 1985, Ron received a call from a man who had been referred to him by Jim – Dave Fasold had been studying the subject of Noah’s Ark and had concluded that it could not possibly have landed on the sheer peak of Mt. Ararat and survived. When he called Jim Irwin with his idea of searching for the Ark elsewhere in the Ararat region using the relatively new sub-surface interface radar, he referred Dave to Ron. And thus, because of Col. Irwin’s referral, Dave Fasold entered the picture. After Ron told Dave about the “boat-shaped object”, Dave was so excited that he wanted to go to the site as soon as possible. A trip was arranged for March 20, 1985. Dave brought along his molecular frequency generator, a device that would prove very helpful in research on the Ark, but also would play another vital role. For it was on this – Dave’s first trip to Noah’s Ark – that Samran el-Motairy would arrange for Ron to re-enter Saudi Arabia, accompanied by Dave Fasold whom Providence had arranged to be there at that exact time. Samran met Ron and Dave in Turkey and went to see the Ark for himself. Convinced of its authenticity, Samran made arrangements for Ron and Dave to go to Saudi. Samran now had first-hand knowledge that Ron Wyatt wasn’t just a kook – he was doing valid archaeological research into subjects which the Koran spoke about. In Saudi Arabia Again – LEGALLY! All three signed and initialed the agreement and on March 31, left Ankara and flew first to Jedda, and then to Tabuk, Saudi Arabia where Samran lives. Spending that night at Samran’s, they headed the next morning for the site of Jebel el Lawz, with a driver and a laborer accompanying them. With Ron giving them directions to the area, they made some wrongs turns and took a break. A Bedouin appeared and they asked him where Jebel el Lawz was. He answered, as Dave Fasold remembers, with “Jebel Musa henna”- which means, “Moses’ mountain is here”! Amazingly, the local tradition recognized this as the right place! They spent the next few hours exploring. When it was time to head back, Samran said he thought they should instead go to Hagl, which was closer, but which was also the town in which Ron and the boys had been imprisoned. This trip, though legal in every way, was still to prove to be a trying experience for both Ron and Dave. Samran announced that he had this great idea for a joke – why didn’t they go by the General’s office who had arrested Ron and the boys, and tell him Ron was back again illegally?! Now, Ron was not pleased at all with this idea, but the situation was such that he had no voice in the matter. So, Samran drove up to the General’s office; he, Ron and Dave went in, and Samran announced to the General that “Ron Wyatt was back without a visa!” Ron had absolutely no choice but to play along – he hoped Samran knew what he was doing. The General looked very shocked when he saw Ron’s quite familiar face again but was reluctantly cordial. After handshakes and minimum greetings, they left the General’s office and went to one of Samran’s friend’s house where the men were to spend the night. That day just happened to be April 1 – April Fool’s Day – and Samran’s “April Fool’s prank”, which was probably just coincidental, of announcing Ron’s “illegal” visit proved not to be at all funny, as they would shortly find out. It was about 3:00 am when they all heard the knock on the door, and before long, Samran hastily told Ron and Dave that they had to leave immediately, for they had just received word that they were going to be arrested. They all quickly dressed, piled into the car and headed toward Tabuk and Samran’s house, which was about 3 or 4 hours down the road. After they had been travelling about an hour or so, suddenly their car was motioned over to the side of the road by the big, black Mercedes which had been following them since they left Hagl. They found themselves in front of the local Sheriff’s office, a building on the desert highway. They all went inside, and recognizing the head man as one of the men he had met when he was imprisoned, Ron decided to act delighted to see the him. Shaking his hand and exchanging the traditional “kisses” on each cheek, Ron wasted no time in pulling out his passport, turning to his valid visa, and extending it for the Sheriff to see. The Sheriff was quite serious and probably quite confused as to what was going on. He and Samran then carried on a serious conversation in Arabic and soon Samran announced to Ron and Dave that arrangements had been made for the Interrogation Team from Hagl (which had questioned Ron and the boys) to meet with them out at Jebel el Lawz and see this “evidence” for themselves. But everyone seemed terribly suspicious of Ron and Dave for some reason. They then left the Sheriff’s office and went back to Samran’s compound in Tabuk, where they waited for the next events. The next morning, they headed out to the mountain, meeting the Interrogation Team, headed by Abu Collet, at the road which leads to the mountain. Ron and Dave, at that point, were split up and had to ride in two different Jeeps with officials in each one who questioned them both intensely. It seemed that they were concerned that Ron and Dave’s interest in the site was for purposes to finding “treasure”- valuable artifacts and gold. But both Ron and Dave each tried to explain that their interest was purely archaeological. Arriving at the site, Ron, Dave and Samran showed the men all the evidences – the altar with the Egyptian-style petroglyphs of cows and bulls; the altar at the base of the mountain; the tops of the 18 foot diameter columns erected 5 feet apart; the marble columns, etc. and the Interrogation Team was shocked but pleased. All, that is except for one man – Abu Collet. When Ron and the boys had been imprisoned at Hagl, Abu Collet had sent some men out to Jebel el Lawz to investigate the site and see if Ron was telling the truth. They were to report any archaeological evidences in the area, but the men returned and said there was absolutely nothing there. And this was what Abu Collet had sent in his report to the King. Yet now, Abu Collet saw for himself that the entire area was full of ancient archaeological evidences. Now, if a mistake such as this had been made in this country, I doubt seriously that there would be any concern about the inaccuracy of the report by the person making the report – but in Saudi, an inaccurate report sent to the King is considered the same as “lying” to the King. And lying to the King is punishable by death, and Abu Collet seemed to be awfully unhappy. It was during this trip to the site that laborers dug into and around one of the many, many double-walled 18 foot diameter columns. But the “life of the party” turned out to be Dave’s molecular frequency generator. The men were fascinated by its abilities to discriminate and locate gold. They “tested” its accuracy by hiding gold objects to see if Dave could find them, which he did. They were so impressed by the ability of this piece of equipment that they offered Dave a proposition – they wanted him to stay and help them locate treasure and they would make him a better deal than Samran had. Dave declined, but about two months later received a call from the Saudi embassy again making him an offer to come back. Finally, Dave had to secretly snip one of the wires, carefully pulling down the insulation so that they couldn’t tell it had been snipped. He had to make them think it was broken. If he hadn’t done that, it began to look like they would have spent all night out there. The people who have been attacking the molecular frequency generator would have a very hard time convincing these men that it didn’t work! During that day’s exploration, the Saudis had separated Ron and Dave, and very skillfully interrogated each man while they worked. At one point, while Ron and Dave were in another location, the Saudis dug something up which caused a great deal of excitement. But neither Ron nor Dave was allowed to see what it was. All either of them knew was that at this point they were told that they were now under house arrest and their charge was that they were attempting to rob Saudi of valuable artifacts at an archaeological site. It was also during this trip that Dave wrote “Dave Fasold and Ron Wyatt excavated this site in 1985” on a piece of paper and, sticking it in a plastic bottle, buried it in one of the holes they had dug. If any future archaeologist excavated the site, there would be no doubt who had been there first! After a few days, an archaeologist was flown in from Riyadh University to Samran’s. The evidence was so compelling now that this was determined a necessity. Ron and Dave told him about all the evidence out at the mountain, and they played Dave’s video of the golden calf altar and the petroglyphs on the TV. Although they have the PAL system, Dave’s NTSC tape played the video in black and white without audio. As they showed him the archaeological evidences, he was very excited about the pictures of Egyptian-style cows and bulls on the golden calf altar and told them that this style petroglyph was not found anywhere else in Saudi Arabia. He had been working somewhere south of this area and was completely surprised to find out this sort of archaeological evidence was in the area. “This is a major discovery!, he said. Several times he shook Ron’s hand and congratulated him on the discovery. The next day was Friday, and this being the Moslem holy day, they did nothing. Technically, Ron and Dave were still under a type of “house arrest”- Ron couldn’t leave the compound, but Dave was allowed a little more freedom and arranged to find someone to take him somewhere part of the day. But Ron spent the day in his room with nothing but to do but watch television. At one point, he turned it on, listened to a Moslem Imam read from the Koran, and then turned it off after about fifteen minutes. Unknown to Ron, that fifteen minutes he watched the TV would play an incredible part in the acceptance of Jebel el Lawz before their trip was over. Tuesday, April 9, they went to the local Prince’s office in Tabuk where they again met with the Interrogation Team from Hagl, the archaeologist from Riyadh University, the Deputy Prince, several Imams, a translator and Samran. The interesting part of all of this was that no one was introduced to Ron and Dave as being the Prince. The Deputy Prince was there, but everyone was bowing to Samran. Chairs were arranged in a circle around the room – all of the men took their seats, and Ron and Dave began to be questioned about Jebel el Lawz. The Deputy Prince, through the translator, then asked Ron, “Why would Musa (Moses) bring the people to this isolated and undesirable spot when there were so many better locations in the area?” This was a valid question, because Jebel el Lawz is not an area that can support life to any extent. There is no water supply. Ron replied simply that “Moses was following the cloud, which led them there”. Then, Ron asked, “Was not Musa a prophet?” As soon as he said these words, all of the men began nodding their heads and trying to “out-yes” each other. But strangely, they all answered before Ron’s words were translated – there is no doubt that they all heard him in Arabic, although Ron is quite sure that he answered them in English because he doesn’t speak more than a few words of Arabic. And with this final question, the interrogation ended. 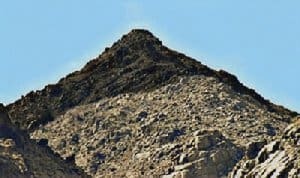 The Saudis were all convinced as to the authenticity of Jebel el Lawz – it was the true holy mountain of God. 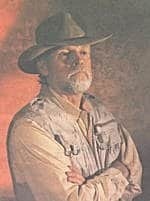 The Deputy Prince, through the interpreter, then proceeded to ask Ron and Dave to stay, excavate and preserve the site. The archaeologist again shook Ron’s hand and congratulated him on the discovery. Promises were made that the King would provide all the funding for the project, a reward would be paid, and Ron would be introduced to the King. But Ron had a very important meeting in Ankara in a few days, and it was too important to miss. Needless to say, the Saudis were not very happy about Ron and Dave’s refusal. They were not used to anyone not obeying their wishes. The Deputy Prince asked Ron “Why won’t you do this – this is what you have wanted for six years?” But Ron explained that he was like “a starving donkey that suddenly had two huge piles of food placed on his left and right sides”- he wanted to eat them both, but could only eat one at the time – and hope the other would still be there when he was able to eat again. When Ron had arrived in Ankara a few weeks earlier, his Government liaison, Mine Unler, had gone with him to set up a meeting with the government. They had made arrangements for him to meet with all of the pertinent ministries for the purpose of presenting all of his evidence for the “boat-shaped” object being Noah’s Ark. They told him he would be allowed to speak to these government officials in English, and that this had never been done before. He was not about to miss this meeting- yes, he had wanted to go to Jebel el Lawz since 1978, but he had been working on Noah’s Ark since 1977. He had to make a choice and there was no doubt in his mind. And his choice had been the right one, because that meeting with the Turks started the ball rolling which would result in the Turks forming the research team. And twenty months later, in Dec. of 1986, Noah’s Ark would be officially accepted. The Saudis could care less about Ron’s reasons- they were clearly upset. Dave’s video was confiscated by Abu Collet’s men, and had been his photographs which they had developed a few days earlier. “You are to forget that you ever came here. We don’t want to read about this in a book or see it in a movie.” Ron and Dave acted agreeable without directly making any promises. Read the Koran in English? Not a Possibility!But before Ron left, he learned another very interesting thing – he had listened to that Imam on the TV read from the Koran on Friday and since he understood it perfectly, he assumed the Imam was speaking in English. He was later told that it is against Moslem law to read the Koran in English. In fact, this offense is so dire that it is punishable by death. The Imam had been speaking in Arabic, yet Ron understood it. Not only that, the Saudis at that meeting all realized with shock that they had understood Ron when he answered them, quoting from the Koran. As we have discussed this subject over the years, we have gained a better understanding of the concept of “speaking in tongues”. When God does things, He has a purpose in it. Other Evidences at Jebel el LawzWhile at the mountain, they had found the remains of a white marble structure which had been erected near the altar at the base of the mountain. These were the white columns Ron had seen on his first trip in 1984. The structure had been destroyed, but remnants of the 20.6″ diameter columns were still lying around the area. They were told by Bedouins in the area that the stone “shrine” had been dismantled and was used in a mosque in Hagl. While Dave and Ron were separated, Ron found a section of this white marble which contained Archaic Hebrew writing, and fearing to show this to the Interrogation Team, he simply buried it where, we feel quite sure, it still remains. One thing that Ron had learned by this time was to be careful about making all of the evidences known. After all, by this time, because Ron had so freely shared information with other Ark-hunters, Noah’s wife’s grave had been dug up and both Noah’s and her grave markers were shattered into small pieces; several other items which contained petroglyphs near the Ark had been either broken up or removed from their sites; and other destructive acts had resulted in the loss of valuable archaeological evidences. Moses Ground the Golden Calf into DustAs we said earlier, Dave Fasold used his molecular frequency generator at the site to locate the presence of gold in the area. There was a positive reading in the area of the altar which contained the cow and bull petroglyphs. There was little doubt in Ron and Dave’s mind that this was the “golden calf” altar which Aaron had constructed, because it was evident that the stones had been arranged. But there was another very exciting evidence – one that Ron again didn’t share with anyone else – and that was this: when he climbed upon the altar and looked over the top of it, something red and glimmering caught his eye. He saw that there was a slight puddle of water from the light, early morning shower on the rock. And it looked almost like a puddle of blood. As he carefully examined this, he saw that this section of the rock had a slight, approx. 4′ x 6′ depression in it which looked as if something had worn or ground it down. Then, as he looked even closer, he saw that the “blood red” was the result of tiny flecks of gold embedded in the entire worn area of the top of the rock. Although the Bible doesn’t explain this, it appeared to Ron that perhaps this was where Moses had ground down the golden calf into gold powder before he put it in the water for the people to drink. But any hopes of closer inspection of Jebel el Lawz now rested in the hope that the Saudis wouldn’t hold a grudge – as soon as he could financially afford it, Ron planned to notify them that he wanted to do the excavation. But, in time Ron discovered that Jebel el Lawz was not a subject the Saudis wanted made public. Jim IrwinIn 1984, after his imprisonment in Saudi, Ron had visited with Col. Jim Irwin at his office, and he had told Jim about both the “boat-shaped object” and Jebel el Lawz. While Jim’s main interest seemed to be in Noah’s Ark exploration, he expressed interest in the site in Saudi and offered any help he could give. Ron suggested a joint venture with Col.Irwin’s organization, High Flight. Dave Fasold had told Ron that he wasn’t interested in pursuing the project, possibly because his work on Noah’s Ark was his first priority. And Ron felt like the Jebel el Lawz project was too large to undertake alone. Jim Irwin not only had connections – Ron knew he was a man of utmost integrity and a true Christian gentleman. And, Jim had offered to do anything he could to help. So, in 1986, Ron met with several people from Jim Irwin’s “High Flight” organization and some other interested parties in Dallas. He presented the evidence for the real Mt. Sinai – verbally, of course – and proposed that they participate in the excavation and documentation. It was tentatively agreed upon and Ron gave them directions to the site, along with descriptions of the artifacts that were to be found there. Jim made several contacts concerning the Mt. Sinai project, which was to include diving for chariot parts on the Saudi Arabian shore of the Red Sea (Gulf of Aqaba). He wrote the “Hashemite Kingdom of Jordan’s Department of Antiquities” requesting permission on behalf of Ron to search for the chariot parts. Their reply to “Mr. Irwin”, dated July 20, 1986, was positive: “Now, concerning the reporting of remains of ancient chariot parts in the Gulf of Aqaba by your friend Ron Wyatt, the Jordanian Department of Antiquities would consider the approval of an underwater Archaeological Expedition aimed at salvaging and studying these ancient chariot parts provided they are located in Jordanian waters.” There was the hitch – they weren’t located in Jordanian waters – the area Ron wanted desperately to explore were in Saudi waters. “Dear Mr. Irwin, Thank you for your letter of Oct. 15, 1986. I appreciate your and your colleague’s interest in the site of Jebel el Lawz. Incidentally, this site was thoroughly investigated by the specialist archaeologists of our department in 1983 and 1986. Their comprehensive investigations revealed that Jebel al Lawz may have been originally, a quarry for white quartzite stones used in the buildings of Petra (Jordan) and Madain Saleh (S. Arabia). The remains of building structures near the quarry and in the nearby area of Jebel al Lawz were possibly residential quarters of the workers who were engaged in exploiting the quarry. Those housing structures were temporary and do not show any sign of long or permanent settlements. The stones exploited were cut and shaped on the site itself. The buildings’ columns reported by Mr. Wyatt are in fact discarded stones left over there. Also the artefacts analysis from the site do not show any relevance to the conclusions referred to the site by Mr. Wyatt, which we believe are archaeologically baseless. Our results do not show any relevance to the topic of Solomon or the Prophet Musa. The artifacts from Jebel el Lawz are similar to other archaeological data recovered from the entire region in which the site is located. We want to assure you, on the basis of the exhaustive and comprehensive investigations, that no such relations exist. And the letter is signed, “Sincerely, Dr. Abdullah H. Masry; Asst. Dep. Minister for Antiquities and Museum Affairs”. 1) When the people who were holding Ron and the boys in prison in Saudi contacted the authorities about Ron’s claim of Jebel el Lawz being Mt. Sinai, they were instructed to send someone out to check for any archaeological remains. This wouldn’t have been necessary if it had been thoroughly explored by the Saudis in 1983, because Ron was there in 1984. 2) There are only two small areas of white quartzite in the area, both much too small to have warranted any quarrying. The entire area is sandstone, granite and is volcanic. It is the least likely spot for any type of quarry. Plus, the region is far too remote to even be considered as a quarry. 3) The columns present at the mountain are white marble, and there is absolutely no white marble anywhere in the region. There is no doubt that the columns were brought in from another location. 4) The letter admits that the artifacts are similar to others in the immediate region, which is actually more proof – for we know that two to three million people would have required the entire region to encamp in. 5) Finally, they make it quite clear that they have “very competent” archaeologists on their staff, and they don’t need anyone else’s help. Quite a different attitude from March of 1985, when the archaeologist from Riyadh University desperately wanted them to stay and excavate, even promising that the king would provide all funding. So why this change of heart? As we have studied the old Jewish writings, we have found reference to an old belief by the Jews that they have a claim to any land that their ancestors are found buried on. And you can be sure that the Saudis are aware of this, and would do anything to keep the Israelis from having any reason to make claims on the area. We have written letters to the King, proving that the Torah (Old Testament) makes it quite clear that the area of Mt. 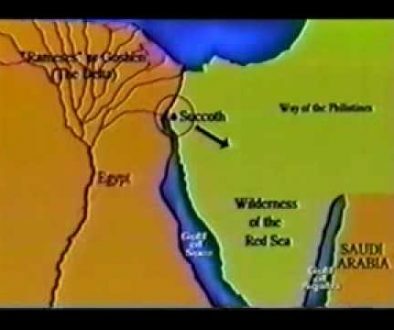 Sinai was not part of the “promised land”. But, for the time being, to Ron it looked pretty hopeless that he would be able to return to the site. Later, Larry Williams published his book called, “The Mountain of Moses” in which he documents how he and Bob Cornuke (Vice-President of “High Flight”) sneaked into Saudi and “discovering” the real Mt. Sinai. The saddest part for Ron was that these people never even contacted him or let him see their photographs, after he had given the “High Flight” people directions to the site and even drawn a diagram of where everything was. We later learned that they went to Dave Fasold and got precise information which allowed them to “make their discovery”. And why not? Dave had seen the evidences and knew they were there. Ron hadn’t made any progress in the intervening three years. At least people would learn about the truth of the real site. As we read Larry Williams’ book, we found out that although they went to Jebel el Lawz, they never found any chariot parts in the Red Sea. They had searched the sea-floor at the Straits of Tiran, far south of where Ron found the chariot wheels. Without this most important evidence, the story was still incomplete. Was this going to be the extent of the evidence of Jebel el Lawz- the real Mt. Sinai? The Frustration- was this the End of Jebel el Lawz? I, Mary Nell Wyatt, will continue to tell of the events which were yet to occur from my own vantage point because while I wasn’t around for the events prior to 1988, I was a part of the events which I will now relay to you. I will state from the beginning that I cannot give the actual names of some of the individuals involved at this point, but everything I am about to tell is completely documented by all persons who are involved. We will make everything known when it is safe to do so, including video testimony by parties involved but for now unnamed. Ever since I have known Ron, I have been acutely aware of his intense desire to return to Jebel el Lawz. We have discussed the subject in great detail many, many times and I have felt as though I had been there, just from listening to him tell me the details from his experiences. I have talked to both Danny and Ronny about their “adventure” in Saudi. But the truth of the matter is that I can’t say that I ever believed we would ever see anything more of Jebel el Lawz than the photos in Larry Williams’ book or on TV shows Bob Cornuke appeared on. But I know for a fact that Ron never gave up on it. And believe me, he tried every possible way he could think of to gain legal entry again. When the Gulf War erupted, Ron contacted the Army Recruiting office to enlist in the Reserves – his idea was that he could apply for duty as an anesthetist to Saudi and go out to the mountain while there. I thought he was carrying this a bit too far – they told him he’d have to sign up for at least a 6-month stay, and that would put a big dent in his research on the other projects. But, it appeared for a time that the plan would succeed. His recruiting officer was extremely excited and hopeful- he said that they needed anesthetists and since Ron had 8 years in the service and was a Korean War veteran, he would enter as a Captain and there should be no problem with his getting the assignment he would request. But, red tape delayed everything and soon, the war was over. Ron has a manner of approaching this archaeological work from which he never varies – he prays about it, then proceeds with his plans. If it is not God’s will, he firmly believes the Lord will close the doors. And the door was closed on this idea. With the war over, they no longer needed to recruit men and Ron never enlisted. In January of 1992, we were contacted by some Korean doctors who claimed to have a tremendous amount of money and they said they wanted to financially help Ron finish his archaeological work. They came to our home and we shared all of the evidences with them that we could, and they then decided that they wanted to go to Egypt and Israel to see the actual sites. They didn’t need to go to Turkey, they explained, because they saw enough evidence to convince them at our home. They were especially interested in the Ark of the Covenant and it became apparent that they had their own reasons – they asked us how much we thought the Ark was worth. With no idea, Ron said it was priceless or something to that effect. Then one of them asked if he thought it was worth several billion dollars, to which Ron said “of course” and “at least,” for we all know that without considering the incredible amount of gold it contains, its true value could not possibly be stated in dollar amounts. It was a moot point, but Ron agreed that it was worth at least three billion dollars. Well, to our surprise, one of the doctors yelled out, “We’ll take it!” Now, we thought he was just kidding but later we found out they really had hopes of buying it from whoever ended up with its ownership. But to continue our story, we soon headed for the Middle East and met up with these Korean doctors in Cairo. They wanted to see the sites and promised they would finance the work of completing all of them. Before we had left for that trip, one of Ron’s Saudi friends had called him. This man had called Ron numerous times in the past, trying to arrange to sell back to Ron his photos and movie film that he had taken when they were all at Jebel el Lawz in ’85. The problem was that he wanted hundreds of thousands of dollars. But when he called this time, the “unnamed” Saudi wanted something else – something in the line of electronic equipment which we could get for him. However, we didn’t have time to purchase it before we left on our trip. So, Ron decided to call his Saudi friend from the motel in Nuweiba, hoping he would fly over and meet us to discuss the proposition – he had been to Nuweiba to meet Ron before, and it was no problem for him to do so. The idea was to get him to bring the photos and film so we could see that he really had them. Ron’s understanding was that the photos and film had been confiscated by authorities and that his Saudi friend wouldn’t have access to them. But, if he did have them, we would arrange to get for him the equipment he wanted in exchange. So, as soon as we arrived in Nuweiba with the Korean doctors, Ron tried to call “the Saudi.” Now, to place a call to Saudi Arabia from the motel, Ron had to go to the front desk switchboard. And the gentleman who was operating the switchboard could see that Ron was having a great deal of trouble getting the person who answered “the Saudi’s” line to understand him – while “the Saudi” spoke excellent English, most of those who answered his phones didn’t. So, the Egyptian gentleman (we’ll call him “Mr. Sayadin”) who worked the switchboard – and who spoke both Arabic and English quite well- offered his “translating” services which Ron most happily accepted. Ron explained a little of the situation to “Mr. Sayadin” so he could converse with whoever answered “the Saudi’s” phone in a fluent and intelligent manner. Each day we tried and each day we were told “the Saudi” wasn’t in but would return the call in a few hours. But after after four days of no luck, we decided it was time to leave Nuweiba. I was in our room, packing, when Ron came in and told me that he had been praying about the situation of getting the photographs of Jebel el Lawz and had been impressed to tell “Mr. Sayadin” the entire story. To Ron’s surprise, the man told him that he could go to Saudi and take the pictures for Ron himself! Now, we both knew that it’s next to impossible for an Egyptian to get into Saudi Arabia. Just like Americans or anyone else, the only way to get in is to obtain work in the Kingdom. The Saudis do not want tourists – they have all the money in the world, and they do not want their people exposed to western civilization – especially the women. But, “Mr. Sayadin” told Ron that his father had been in government work and had friends who could get him into Saudi. OK.
Perhaps he was telling the truth – perhaps this was how the Lord was going to answer our prayers. But then, Ron told me about the “deal” he had made with “Mr. Sayadin”. Ron told “Mr. Sayadin” that he would pay him $25,000.00 if he was successful – that meant that the photographs and video were of good quality and the photographs were clear. And that’s when I nearly fainted. Ron had made this generous offer to insure that “Mr. Sayadin” would be properly motivated – and he was basing the sum on the fact that our Korean doctor friends had promised us this much money for the Mt. Sinai project. But I wasn’t so optimistic on ever receiving any assistance from these doctors. Ron, on the other hand, felt differently. He tends to take people at their word. With this “deal” already made for “Mr. Sayadin” to go to Saudi, I told Ron about something that I had done – we had just purchased a fax machine a few weeks before our trip and the night before we left, I had made three copies (using the fax) of the map of NW Saudi Arabia and had them in my purse! We didn’t have a copier and I can still remember running off those maps, folding them up and sticking them in the zipper pocket of my purse. No thoughts had run through my mind that we may need them – I just did it. And if we ever needed them before, we certainly needed them now! So, we took those maps and, meeting with “Mr. Sayadin”, carefully drew the entire route of how to get to Jebel el Lawz from towns in both the north and the south areas. We marked all the wadis or canyons (there aren’t many roads in the region so the area would have to be travelled in a four-wheel drive vehicle, through these rough wadis). On the back of the map, I sketched pictures of the drawings Ron had drawn years earlier of the cows and bulls on the golden calf altar. I drew the two standing boulders with a solitary tree between them – the positive identification of the Holy Precinct area at the foot of the mountain. I drew everything Ron could remember which would identify the locations – and we gave them to “Mr. Sayadin”. In such an isolated and untamed land – with no landmarks or signs – these drawings were imperative. Otherwise, he would have no idea at all what to look for. At our meeting that afternoon, the plan was formulated in detail – “Mr. Sayadin” would need a video camera, a still camera, film, airline tickets, and car rental fees. I spent the rest of the afternoon teaching how to use my video camera – most cameras work about the same – and I recommended two models which he hopefully could find in Cairo. He was quite an intelligent man and caught on very quickly. Then he estimated that he would need $1,000.00 to get the job done, so Ron gave him $1,500.00 in cash, just to be on the safe side. Ron and I both stressed to him that he was not to tell anyone else about this! Jebel el Lawz had been declared a protected archaeological site soon after the 1985 trip, and it was now fenced in and carefully guarded. He would have to be very careful. In fact, that was one of the conditions of our contract – that he keep everything in strict confidence – and “Mr. Sayadin” agreed wholeheartedly. We told “Mr. Sayadin” about Ron’s other archaeological work and showed him photographs of Noah’s Ark. We wanted him to understand our purpose in getting the photographs of the area. We felt that the more he understood, the more he would know what to look for and film. Being a Moslem, “Mr. Sayadin” knew about Noah’s Ark and Mt. Sinai, (or the Mountain of “Musa”). But, we only had one afternoon to convey all this information to him. Now, remember, I’m telling this from my point of view – so I will be honest and say that I was quite negative about the entire venture. Ron is the optimist, I’m the pessimist. As far as I was concerned, we could kiss that money good-bye. But, Ron was amazingly confident that he had done what he was supposed to do. He was at complete peace with the situation and had no concerns because he had prayed and asked for wisdom to know what to do. But my thoughts were “what would we do if this man did get the photos and videos? Where in the world would we get the other $23,500.00 we would owe him?” After all, we had heard more than one promise from people that they were going to fund the archaeological work – but no one had actually done so. I never once believed the Korean doctors would follow through on their promises. Where would we get the money to pay “Mr. Sayadin”? We don’t own a home or anything else we could mortgage; both of our automobiles are 1985 models and if we sold both of them, I doubt we could get $5,000.00. This was a time that gave me great trial and when it was over, I had learned a great lesson as you will soon see. In about a week, we arrived back home. Each day and night, we prayed, “Please Lord, let us get the photos and videos of Mt. Sinai if it is Your will.” But unknown to us, a most astounding set of events was taking place. After we had been home several days, the phone rang, and it was “Mr. Sayadin”. He told me that he had underestimated the cost of getting the job done and needed $2,000.00 more, which he wanted me to wire to him. My heart sank. I felt like we were just throwing money in a hole. Even with political connections, I wasn’t convinced that this man could possibly get into Saudi, much less out to the isolated area of Jebel el Lawz. And even if he did, could he properly operate the video and still cameras? And even if he could do this, would he photograph the correct things? I seriously doubted it. Contacting Ron about the call, he told me to go to the bank and wire the $2,000.00 – which I may add, was almost all we had at that time. I went to the bank with the wire instructions “Mr. Sayadin” had given me and I can recall that drive to the bank as if it was yesterday. The entire trip, I was praying that if this wasn’t the Lord’s will, to please let something happen that we wouldn’t lose the $2,000.00. It wasn’t “our money”- it was “His money”, and we desperately wanted to be good stewards. I specifically prayed that if this wasn’t going to accomplish the Lord’s purpose, for Him to somehow stop the wire from going through. But in reality, I knew that very little would interfere with a wire transfer. The only thing that might cause it to kick back was if the instructions were in error. I had worked for a stock brokerage firm for twelve years and had sent wire transfers hundreds and hundreds of times. And as far as I could tell, I had all the information that I needed to get a transfer to Cairo. So, I sent it at approximately 1:30 pm. My experience had been that if a wire had been rejected, notice was received within a few minutes and the bank usually called by 4:00 since that’s when their department closes. 2:00 came, 3:00 came, 4:00 – and no call. Then at around 5:20 I answered the phone. The bank called to say that for some reason the wire had been returned. My heart just pounded! I told Ron – since I had prayed that the wire would come back if this wasn’t what the Lord wanted us to do, I thought surely that would be the end of it. But it wasn’t. That had been my prayer, yes – but Ron had a standard mode of operation. He tried three times to get something done before he gave up. He told me to call “Mr. Sayadin” back, see if there were some wire instructions he had failed to give me, and try again first thing in the morning to re-send the money. I called “Mr Sayadin” at home and sure enough, he had failed to give me his bank’s identification number. It seems that his bank didn’t have an office in New York and it had to go through a major U.S.bank. I had the correct numbers to get it to the New York bank; I had his correct account number at his bank in Cairo; but I didn’t have his bank’s “account” number at the N.Y. bank; and he gave this to me. It was too late to resend it that day, so I’d have to try again tomorrow. The next morning, I called our bank at 10:30 and asked them to re-send the wire with the addition of this account number. They told me that they couldn’t do it over the phone – I needed to come down in person because wire transfers had to be signed personally each time they are sent, even if it is a retransmittal. I replied that I’d be right down. But the lady in the wire-transfer department told me to wait until about 1:30 because the wire system was “down”, or not working. I waited and watched the clock – I didn’t want to be late because I knew that the wire systems all closed at 2:00 central time, and if I got it off at 1:30, I’d be cutting it close. And while I waited, the phone rang. Ron was home at that time and he answered it. As I listened to his part of the conversation, I knew this was a strange call. He got out his pen and wrote down some information and soon hung up. Looking at me, he was almost pale. I asked him who that was and he explained that it was a person who lived in our area and that they asked if he was Ron Wyatt. He said, “yes,” and then they went on to explain that they didn’t know what this was all about but a “friend” of theirs had just called them from Saudi Arabia and asked them to try to locate a man named “Ron Wyatt” who lived in Nashville, and tell him to immediately call him in Saudi. This person gave Ron the phone number. So, he called and this is the story he heard on the other line. (We’ll call this man in Saudi,”Abu Hesham”). When Ron called him, he told Ron this very strange story: that he had been touring Egypt a few weeks earlier – the same time we were there – and was particularly interested in visiting the traditional site of Mt. Sinai. He had rented a car and drove to St. Catherine’s Monastery. He explained that he had spent several days exploring the region and came away terribly disappointed – he knew this traditional site wasn’t authentic. There was no evidence nor did it fit the Biblical description. But, his story continued, on his way to St. Catherine’s, he had stopped to spend the night at the same motel at Nuweiba that we had stayed at. In fact, he checked out only a day or two before we arrived. At that time, he had become quite friendly with “Mr. Sayadin”, and told him that he lived in Saudi Arabia. Well, “Abu Hesham” toured St. Catherine’s, and about a week later returned to the motel at Nuweiba. He had arrived within thirty minutes of the time we had left. And, he told Ron, when he arrived, “Mr. Sayadin” rushed to his car with what seemed to be a “suspiciously extreme” amount of happiness at seeing him. As “Abu Hesham” checked in, “Mr. Sayadin” began to rant and rave about this “Mt. Sinai” in Saudi Arabia, and even produced the map we had given him that very afternoon. “Abu Hesham” was very confused as to what the whole thing was about, but listened carefully – after all, he had come to Egypt especially to see the site of Mt. Sinai! As the discussion progressed, “Mr. Sayadin” began to talk about Ron – not by name – but made references to Noah’s Ark. And it’s at this point that the story takes on a most unbelievable strain. But I assure you, it’s true. “Abu Hesham” told Ron that over a year earlier, a friend of his in the U.S. had sent him a video tape copy of a TV program featuring a man discussing the discovery of Noah’s Ark. His normal practice was to transfer the tapes he received to the format he used at home- this way, he could reuse the tapes sent to him in his video camera. It isn’t easy to get tapes over there. So, on this trip to Egypt, “Abu Hesham” had brought ten used video tapes to film his trip. When he arrived at the motel in Nuweiba, he had used nine of them. After hearing “Mr. Sayadin” talk about “this man” who’d found Mt. Sinai and Noah’s Ark, he thought about the tape that had been sent to him from the U.S. He reached into his camera bag and pulled out his remaining unused tape. He put it in his camera, and pressed “play”. There in the eyepiece, he saw the white-haired, bearded man who had been on the program speaking about Noah’s Ark. He gave the video camera to “Mr. Sayadin” to watch. He only watched for a few seconds when he began to shout, “That’s him! That’s the man that just left here! That’s the man who gave me the map! !” Needless to say, they were all quite shocked. The tape was of a TV program called “The Good Life”, which Ron had appeared on in Feb. 1990 in Clearwater, Florida, in which he told about Noah’s Ark. Now, “Mr. Sayadin” had known while we were at the motel that “Abu Hesham from Saudi Arabia” would be coming back to the motel, for he had already made reservations. And all the while he was agreeing to help us, he had his own plan. He would give “Abu Hesham” the map of Jebel el Lawz and asked him if he could film this area. And then, “Mr. Sayadin’s” plan was to arrange to fly to Saudi and pick up the video from “Abu Hesham”. What he didn’t tell “Abu Hesham” was that he would then collect $23,500.00 from Ron. My fears proved to be reality – “Mr. Sayadin” didn’t have the connections to go into Saudi as he had told us – his plan all along was to take advantage of the one trip to Saudi every Moslem is allowed to make – a “Haj” or pilgrimage to Mecca. His plan was to go to Saudi, using this “haj” visa privilege, and get the film after “Abu Hesham” did the filming. I have to admit, “Mr. Sayadin” was clever. He rolled out the “red carpet” for “Abu Hesham”- his room, meals, and everything were “on the house”. “Mr. Sayadin” was motivated just as Ron had wanted him to be. But his plan didn’t work. After “Abu Hesham” got over the shock of the events that had just taken place, hearing the story of the “real Mt. Sinai” and Noah’s Ark, and the “coincidence” of the man on the video tape being the same man “Mr. Sayadin” had met, he returned to Saudi where his own vehicle was waiting for him just across the gulf. Taking the map “Mr Sayadin” had given him, he drove right to Jebel el Lawz and went to every site we had marked on the map. He videotaped and photographed everything possible. He had to use the only video tape he had left – the one of Ron’s TV program. And arriving at his home, he played the copy of the tape of that TV program and learned that the man was named Ron Wyatt and that he lived in Nashville, Tennessee. The first thing he did was call a friend who just happened to have moved to the Nashville area, and told this friend to find “Ron Wyatt” in the telephone book, call him, and tell him to call him in Saudi immediately! And that brings us up to the point where Ron called “Abu Hesham”. When “Abu Hesham” finished telling this amazing story, he then told Ron he wanted to give him all the video and photographs! Our prayers were answered! And that was the phone call we received just before I was to go to the bank and wire “Mr. Sayadin” the extra $2,000.00! Not only had Ron’s prayers for documentation of Jebel el Lawz been answered, my prayer about sending the money had also been answered – and I didn’t wire it! “Mr. Sayadin” had blatantly committed a “breach of contract” which released us of any further obligation. In fact, Ron’s airline ticket to the Middle East to meet “Abu Hesham” and get the video and photographs of Mt. Sinai cost just about $2,000.00 – the amount we were about to wire! Within three weeks, we had the documentation Ron had been wanting desperately for eight long years! Ron spent several days with “Abu Hesham”, discussing Jebel el Lawz and many other things. During this visit, “Abu Hesham” told his part of the story on video. When Ron got home and I watched the video, I almost couldn’t believe it had really happened. “Abu Hesham” became a very close friend and has been able to completely document the entire area of Jebel el Lawz, Rephidim, Elim, the beach on the Red Sea where the multitude arrived after crossing, and much more. We now have over twelve hours of video and about four hundred photographs! It is perhaps the most spectacular miracle I have ever witnessed. But for now, we must protect “Abu Hesham’s” identity. He has told us that he will be in grave danger if it is discovered that he has photographed this area, because the Saudis are now jealously guarding it. What Happened to “Mr. Sayadin”? If you are wondering what happened to “Mr. Sayadin”, who tried to take advantage of us, he is still a good friend. We called and told him we weren’t wiring the money but would meet with him in Egypt in a month or two. When Ron met with him and told him that there wasn’t any need for him to go to Saudi, “Mr. Sayadin” asked no questions and even offered to give back the $1,500.00 since he had been unable to complete the job. But Ron and I agreed to tell him to keep the money, and we in fact gave him more to help him start his own business. We consider him and his family good friends and have even dined in his home. No questions were ever asked; no explanations were ever given. “Mr. Sayadin” was happy – “Abu Hesham” was ecstatic at knowing that the Lord had used him in such a spectacular manner; and Ron was thrilled beyond expression. I, too, was thrilled to death to be able to see so vividly how the Lord answered our prayers. It was a series of events I will never, ever forget. We are anxious to make the evidences public for all to see – however, when that will be possible, we don’t know. But after the way things worked out, we are all quite willing to “wait on the Lord” – no questions asked! The thing that “Abu Hesham” said was the most astounding to him was the fact that on that trip to Egypt, he had desperately wanted to visit the actual site where God had given the ten Commandments to the people. He had wanted to walk on “holy ground.” He had thought surely that his desire would be fulfilled when he went to the “traditional” Mt. Sinai in Egypt. Yet, he came away from that site completely disappointed and disillusioned. But within thirty minutes of his arrival at this little motel in Nuweiba, he held in his hands a map showing a route to a mountain which some man claimed was the true Mt. Sinai. Following that strange map, he fulfilled his dream and more. And because he was obedient to God and didn’t take the opportunity to “become the discoverer of Mt. Sinai” as most would have done, he has made it possible for others to very soon see all the wonderful evidences of Mt. Sinai. God knows who He can trust to do His work, even if we don’t! I honestly never really believed we’d ever have the documentation on Jebel el Lawz. Why? Because it had been five or six years since Ron had found it and every attempt he made to contact the Saudis had been met with stony silence. But, I was wrong to take that attitude. It isn’t my job to give up on anything. It is my job to be willing to do whatever the Lord chooses, and know the He has a time for all things. He is waiting for all us to get to that point, for only then when we are willing to wait on Him and not rely on our pitiful, faulty human reasoning, will we be faithful servants. This conversation took place at the foot of the “mountain of God”. Moses was even told to remove his shoes, as he was standing was “holy ground” (verse 5). So, we now know that Moses was in Midian, in the “backside of the desert”, which seems to us to imply the area opposite the main portion of the desert or, the other side of the mountain which provided the border of the desert. We make this assumption simply because in order to have a “backside of the desert”, there must be something which marks a separation of the “frontside” and the “backside”. When Ron studied the Biblical account, he noted these references – that the mountain to which Moses was to lead the people was in Midian; and that the place where Moses spoke to God in the burning bush was specifically stated to be in the “backside of the desert”. With this information, along with the discoveries of the chariot parts in the Gulf of Aqaba, he looked for a mountain on the eastern side of the gulf which fit this description. There was only one candidate in his opinion, and this was Jebel el Lawz. His flight maps showed this mountain to be in an almost semi-circular range, with a vast desert area around it as well as more than enough room for the encampment of perhaps a couple of million people along with their flocks and herds. Not only that, but there was a single, large oasis located perhaps 10 to 15 miles away – an area that could have been the home of his father-in-law, Jethro – and this was the town of Al-Bad. He saw that there was desert area around Jebel el Lawz, between Al-Bad and the highest peak in this mountain range – and that there were valleys in the mountain range which Moses could have led his flocks through, taking him to the “backside of the desert.” Ron was convinced that this mountain had to be the one. A careful examination of the eastern shore of the Sinai peninsula allows for only one place where two million people and their flocks can be gathered. It is the wide expanse of beach near Nuweiba, the south end of which is closed off by steep mountains! Nearby is a wide and wild mountain gorge known as the Wadi Watir, an ancient dried-out riverbed that forms a natural roadway into the Sinai desert, while both the Bible and Josephus indicate that Moses took the Hebrews to Mt. Sinai after they crossed the Red Sea into what is now known as Saudi Arabia. Interestingly, not far from the opposite shore is a mountain known as Jebel El Lawz, a steep, forbidding peak. Is it possible that this is the Mt. Sinai that Moses speaks of? The fact is clear that the Sinai Peninsula was always considered to be Egyptian territory. There is an abundance of evidence that the Egyptians controlled the Sinai Peninsula during the time of the Exodus because of their mining operations there. This archaeological evidence is still present and evident today. The peninsula today doesn’t even have any population to speak of except those who live around the few oases, many of which today contain the gasoline stations for travellers – travellers who are going to either the coast of the Gulf of Aqaba to go scuba diving or those visitors who go to the traditional Mt. Sinai. Above, we have read how the Bible clearly tells of how God’s Presence at Mt. Sinai caused the earth to shake and smoke, much like volcanic activity. And several men in the past have recognized this fact. Charles Beke, in the last century, was convinced that Mt. Sinai had to have been a volcano. He to the Sinai Peninsula, hoping to find the exact mountain by finding one which displayed volcanic evidences. But, traveled he came away disappointed because he found that not only was the traditional site non-volcanic, the other mountains in the Sinai were also non-volcanic! He then travelled to NW Arabia where he discovered that all down this western side were “harras”, or vast lava and ash fields. Whether the area of Mt. Sinai/Horeb was volcanic, or whether God’s Presence resulted in the volcanic-like activity doesn’t really matter. The Biblical description speaks of events which would result in the area having experienced these things- and the “consuming fire” of God’s Presence would leave an indelible mark on the mountain. “Midian, a son of Abraham and Keturah (Gen. xxv.2; i Chr. i.32); progenitor of the Midianites, or Arabians dwelling principally in the desert north of the peninsula of Arabia. Southwards, they extended along the eastern shore of the Gulf of Eyleh [Gulf of Aqaba]…” “Smith’s Bible Dictionary”, under “Midian”. However, in this same book, under “Mt. Sinai”, we find the traditional location in the Sinai Peninsula given. We have numerous commentaries which locate Midian in Saudi Arabia, but few which locate Sinai there. Why? In our opinion, God allowed the true location to remain unknown until He saw fit to reveal it. If we carefully study the Biblical evidences which archaeology has revealed, we will see that the vast majority of these came to light beginning in the 1800’s – the time in earth’s history in which these things could be presented to the world in publications and books. Had they been known for any length of time, there would be no evidence left. “The Biblical references connecting Sinai with Mount Seir, Edom and the land of Midian seem clearly to indicate this region east of the Aelanitic Gulf (g. of Akaba) as pointed out by Beke (1834), Walhausen (1886), Sayce (1894), Moore (1895), Shede (1897), Gall (1898),Gunkel (1903), Edward Meyer (1906), Schmidt (1908), Gressmann (1913), Haupt (1914) and by Alois Musil in `The Northern Hegaz” (1911).” “On the Track of the Exodus” by C.C. Robertson, p. 87. The area of the “holy precinct”, the section Moses was directed by God to enclose in “bounds” at the foot of the mountain, is enclosed by huge, 18 foot diameter round columns. These cannot be seen except upon close examination because over the intervening 3,400 years, soil and rock has accumulated around them raising the ground level. Today, only the tops of a few can be seen, sticking up through the ground just a few inches. It was one of columns that was partially excavated when Ron and Dave were there in 1985. Their construction is as follows: the outer wall, constructed of brick-sized rocks, is 18 foot in diameter; and the construction is similar to the large Egyptian columns. Within this enclosed outer wall is another interior wall, several feet smaller. In between these two walls, other stones of the same size are placed vertically. Their location can be seen quite easily, as the soil covering them drops off about twenty feet along their entire course. The evidence shows that they extended across from north to south in a fairly direct line, then end where a dried riverbed cuts through (this riverbed begins high up in the mountain, comes down the side, and extends out eastward). See Deu. 9:21. The boundary columns then begin again along the southern edge of the riverbed, travel east, turn south and then turn westward, where they extend all the way to the southern side of the mountain. Within this boundary, very near the point where the base of the mountain meets the level plain, are the remains of a large, uncut stone altar. When viewed looking west, the entire area of the holy precinct can be seen. In immediate view to the right is a portion of the mountain which features double “peaks”. Just below these peaks, in the face of the mountain, can be seen a cave. On the far right peak, there are two extremely large boulders with a solitary tree growing between them. This strange tree which seemingly is growing out of the granite, is one of the first things Ron noticed when he first saw this mountain, and it is this tree which positively identifies the mountain. In an area with miles and miles of mountains, there is no mistaking this particular site – when you see the tree, you know you are there. In fact, “Abu Hesham” told Ron that it was only when he looked up and saw the tree between the massive granite boulders that he realized he was at the right mountain! In archaeology, there are three things which are usually present in an archaeologically important site – first, of course, is physical evidence. Second, is ancient inscriptions in the area, identifying or connection the particular discovery with the area. Finally, and very importantly, are the study of local traditions passed down through the natives of the region. As we mentioned earlier, the Bedouin, Ibrahim Frich, told Ron and Dave that “Jebel Musa Henna”, when they were at Jebel el Lawz. In other words, the local people even refer to this mountain as “Moses’ mountain”. We know for a fact that Mohammed, the author of the Koran, visited this area at least once. For in about 631 AD, he concluded peace treaties with the Christian chief of Aqaba and the Jewish tribes in the oases of Maqna. This is the immediate area to the north and south of Jebel el Lawz – within walking distance. And gain, as we read the Koran, it appears that the peoples of this area knew the site of Mt. Sinai and this “brook” very well. This is an amazing description of a scene which perfectly fits the evidence from the site! The “sacred hollow” describes the area at the foot of the blackened mountain, which is protected on three sides by the mountains. The tree is certainly to the right of the river and again fits. This illustrative language says that the people whom are being addressed were not on the “western” or opposite side of the mountain, neither were they on the eastern side, which is where “those witnessing” were located! We can visualize Moses and Joshua looking out over the area from the plateau, getting ready to begin their final descent. They look out over the uninhabited holy precinct, and just outside the boundary columns, the people are in a great commotion, singing and dancing. And just beyond the great multitude, nestled close to a small hill, is the golden calf altar. As they walk through the holy precinct and near the camp, just inside the borders of the holy precinct, they can clearly see the golden calf high upon the altar. Moses throws down the Tables of Stone, just inside the Holy Precinct, but in the sight of the people. He keeps walking straight ahead, directly to Aaron and the altar. Taking the golden calf, he throws it in the fire which Aaron had used to melt the gold in order to form the calf (see verse 24). With the calf perhaps melted down into a formless “blob”, he takes it and climbs upon the altar Aaron built and grinds it down into dust. He then takes the large pile of gold dust to the stream which flows from the mountain and strews it in the water at the place where the stream flows out of the Holy Precinct. Since no one can venture beyond the borders set about the Holy Precinct, no one who drinks the water can escape the pollution of the gold in it- and the entire camp probably experienced tremendous stomach problems from the gold. Thus far, the evidences at Jebel el Lawz fit the Biblical description perfectly! If we stand just outside the boundary columns and look directly west into the Holy Precinct, near the foot of the mountain to the left is an altar made of uncut stones. Standing in front of this altar, it is about shoulder high to Ron- but if you walk around behind it, the slope of the ground beneath it causes it to only be a little above knee high to Ron. Again, the altar fits the Biblical description. The stones are natural in shape – no tool has been used to shape its stones. 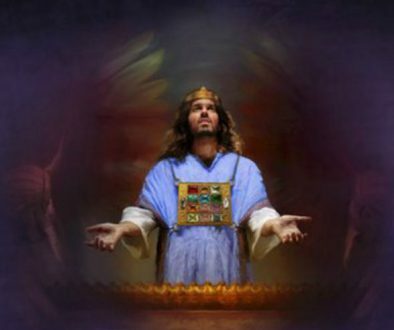 It has no steps – Moses could easily make the offerings upon it when he stood behind it, which would have him facing the congregation. Extending out from this altar at about a 90 degree angle, is a sort of walled in area. Perhaps this was where the animals were slaughtered, or it may have been the foundation for some type of tent/building. With no more information than this as to the twelve pillars, we look to the Hebrew word translated to read “pillars” – it is “matstsebah”. Could this be the origin of the word “massebah”, which is a term for a one-piece, standing stone pillar? These were clearly one piece stones. So, we can expect that the “pillars” Moses erect were not constructed out of numerous rocks fit together. And in the Holy Precinct, to the far right and near the front (looking westward into the area) there is a semicircle of twelve large granite boulders, about six feet wide and nine feet tall (this is an estimate based on the drop in ground level). These are, like the eighteen foot diameter boundary columns, covered by alluvial soil, washed into the area by seasonal showers and only the tops are visible. Near the altar at the base of the mountain, are the remains of some type of shrine built of pure white, polished marble. Its style indicates it was from a much later date- it was round, with eight sets of double columns at even intervals. Its roof was a polished dome. The pieces of the columns are about twenty-one inches in diameter, with one measurement taken as 20.6 inches- the royal cubit used in Noah’s Ark and in building the Tabernacle and its furnishings. There are quite a number of these still lying in the area, and were seen by Ron on his first trip to the site in 1984. When Ron and Dave were exploring the region, each separated by the Interrogation team, Ron found a piece of white marble with an inscription on it in Archaic Hebrew, which he committed to memory and buried, not telling the Saudis about it. He believes that section will prove that Solomon had the shrine built if he can ever get back out there and retrieve it, or have it safely retrieved. Just over the western side of the mountain range, opposite the Holy Precinct, these is an area which features an incredible, five to six-story rock perched upon a hill that it about 200 feet high. This rock is split through the middle and displays the pattern of water erosion and evidence that numerous streams came forth in several directions. About 200 yards from this rock, is another altar, similar in construction to the one in the Holy Precinct. Exodus 17:15 “And Moses built an altar…..” This area also features an immense plain area in which the battle with the Amalekites could have taken place. The evidence is overwhelming – we have only touched on a small amount of the archaeological evidence at this site. When we can do so without compromising “Abu Hesham’s” safety, everything will be made public and available in video and publications. For now, we must continue to be patient! A couple of years ago some of us found ourselves in a situation in which it was very important to communicate with people that did not understand our language and we did not understand theirs. It was soon recognized by both parties that the best way to understand was by providing a picture. This could be accomplished by literally drawing a picture, or depicting an object using hand motions or positions much like the game of charades. A mental picture could also be presented by certain sounds, such as “moo” for “cow” or “baaa” for “goat.” This gives us some insight into what it must have been like immediately after God confounded the language of all the earth. GEN 11:1 And the whole earth was of one language and of one speech. 2 And it came to pass, as they journeyd from the east, that they found a plain in the land of Shinar; and they dwelt there. 3 And the said one to another, Go to, let us make brick, and burn them thoroughly. And they had brick for stone, and slime had they for morter. 4 And they said, Go to, let us build us a city and a tower, whose top may reach unto heaven; and let us make us a name, lest we be scattered abroad upon the face of the whole earth. 5 And the LORD came down to see the city and the tower, which the children of men builded. 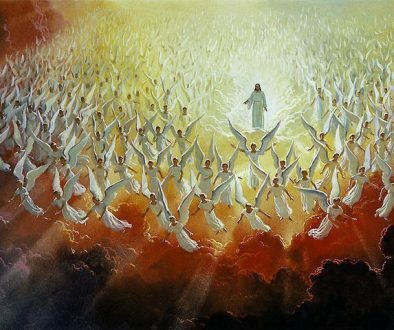 6 And the Lord said, Behold, the people is one, and they have all one language; and this they begin to do: and now nothing will be restrained from them, which they have imagined to do. 7 Go to, let us go down, and there confound their language, that they may not understand one another’s speech. 8 So the LORD scattered them abroad from thence upon the face of all the earth: and they left off to build the city. 9 Therefore is the name of it called Bable; because the LORD did there confound the language of all the earth: and from thence did the LORD scatter them abroad upon the face of all the earth. The Lord confounded language and scattered the people all over the earth. Devoid of a common language, how did the people communicate without understanding each other’s words? One possible answer: the same way we did, by drawing pictures. The character that represented “life” was the “ankh” (see figure B) (Figure to be added). It was sometimes worn on the body as an amulet for good luck. This is another good example of how picture writing was used all over the world and how it changed to reflect the various cultures. There is good evidence that the “ankh” originated with the Chaldean “T” or cross (see figure C) (Figure to be added) which was representative of Chaldean sun worship. The Egyptians added the sun disk at the top to further identify it with their character for the sun (see figure D). in Ninevah, the archaeologist Layard found the cross within the circle (figure E) (Figure to be added) which he also recognized as a symbol of sun worship. Sometimes hieroglyph text would be enclosed in an oval design called a “cartouche” (fig H). Symbols inside the cartouches represented sounds which composed the names of the rulers. (fig I). The key to reading Egyptian hieroglyphic text was discovered in 1799 when soldiers of Napoleon’s army found a slab of stone known as the “Rosetta Stone.” The inscripton on this stone was written in three different styles — hieroglyphic, Demotic, and Greek. From the Greek text, both the Demotic and Hieroglyphic could be translated. REV 19:11And I saw heaven opened, and behold a white horse; and he that sat upon him was called Faithful and True, and in righteousness he doth judge and make war. 12 His eyes were as a flame of fire, and on his head were many crowns; and he had a name written, that no man knew, but he himself. 13 And he was clothed with a vesture dipped in blood: and his name is called The Word of God. 14 And the armies which were in heaven followed him upon white horses, clothed in fine linen, white and clean. 15 And out of his mouth goeth a sharp sword, that with it he should smite the nations: and he shall rule them with a rod of iron: and he treadeth the winepress of the fierceness and wrath of Almighty God. 16 And he hath on his vesture and on his thigh a name written, KING OF KINGS, AND LORD OF LORDS.